Technique: The importance of first touch, controlling surface and ball manipulation is emphasized in futsal. The speed if the hard court is mitigated by the weight of the ball and the ball naturally stays low so players receive a lot of the ball to feet. Accepting that the first emphasis of player development is comfort with the ball, futsal and soccer share the importance of individual ball mastery. Tactics: With four field players on a futsal team, the incorporation of the goalkeeper in effective possession is critical. Goalkeepers are an important part of possession and attacking development as is increasingly the case in soccer. 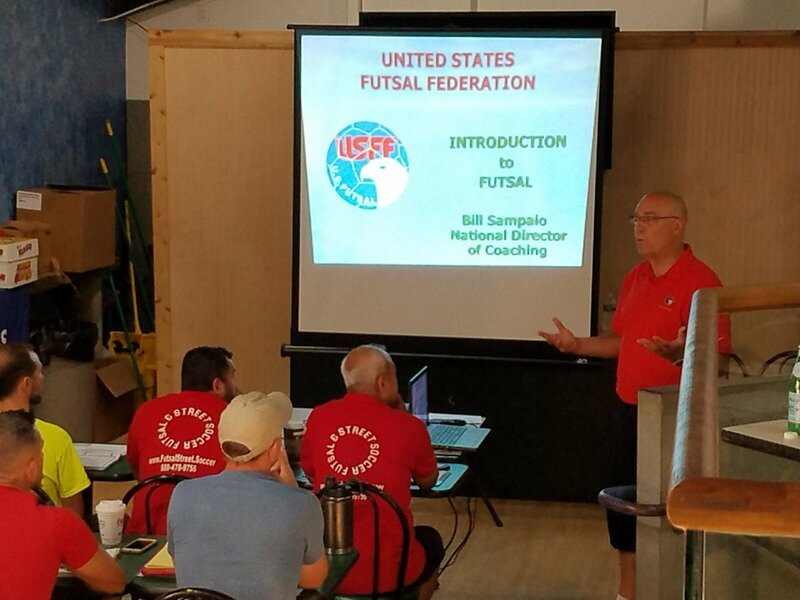 In terms of developing decision making on and off the ball, futsal is extremely powerful with reduced numbers and a smaller playing surface than soccer. Physical: the constant change of direction and explosive movement of futsal mirrors other indoor sports such as basketball and volleyball but is most closely aligned with soccer. Game based coaching methods: As coaches we often hear the adage "let the game be the teacher" - an assertion that player understanding and performance is best served by playing and less by constant coaching intervention. A fast paced 5v5 attacking and counter attacking game played on small court seems a perfect answer for coaches supporting this philosophical approach. Tactical - cognitive development: We are conditioned to believe tactical development is an advanced coaching application reserved for older and more advanced players. Although associated with more primitive coaching methods, we often attribute tactical coaching with young players as early signs prioritizing wining over development. Although there are some merits to over - emphasizing technique over tactics, this extreme viewpoint has limited our ability to develop decision making and cognitive abilities of players. The Royal Spanish Football Federation (RFEF) found futsal to provide a perfect training environment to integrate techniques, tactics, conditioning and decision making concurrently, resulting in young players with outstanding "game intelligence". Reading the game: As a rule, experienced players will make better decisions during the game, However, the trajectory of a players learning curve, the appropriateness of the decisions and the speed to react will differ considerably between players. To improve decision making, a coach may want to replicate and increase the frequency of the action so players can refine their thought processes. The confines of a futsal court and limited number of players eliminates some of the extraneous variables and increases the likelihood of particular scenarios presenting in the flow of a game. Interchanging players between futsal and soccer training environments can be an outstanding way to nurture intelligent players. Two Way Players: Often in soccer, units of the team will not actively involved in defending or attacking sequences. This is rarely the case in futsal. All five players are required to participate in both phases of play, imposing greater physical, cognitive and technical demands on players. 1v1 Player: Somewhat similar to the tactics employed in basketball, coaches will bounce between man-marking and zonal defensive strategies . Inevitably, players will find themselves face to face with a single opponent and the ability to succeed in the 1v1 duel will impact the effectiveness of that player. An effective attacking player will beat their opponent and create a desirable numerical advantage. Conversely, a defender that is capable of slowing down an attack and keeping attacking sequences in front of the defensive unit is equally as valuable to a team. Goalkeepers Offensive Contributions: with only 5 players from each team on the court, futsal coaches regularly aim to create numerical overloads in the attack. when a team has developed controlled progression and/or the opponent is defending deep in their own half, it is not uncommon to see the goalkeeper enter into the attacking half of the field. Depending on the tactical formation, the goalkeeper will take on the role of of the center player to allow teammates to move into deeper attacking positions. Although there is a risk, commitment to this strategy has developed competent and confident keepers with exceptional foot skills - a real asset for keepers in modern soccer.